To celebrate father’s day a little early, I decided to combine a few of my husband’s favorites including grilled pizza and spicy Mexican food. 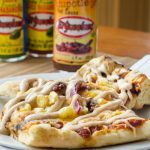 As with many of my recipes, I decided to twist the two and make a spicy grilled Mexican chipotle pizza using this awesome smokey, hot sauce that’s from Lowes Foods called El Yucateco Chipotle Hot Sauce. When I make pizza, I make everything I have time for from scratch. For this pizza that includes the dough, sauce, and chipotle dressing. The ingredient list might look long, but it’s for the WHOLE pizza, even the toppings. You can decide how you would like to manage your time, possibly with store-bought versions. I decided to make the sauce the night before since my kids thought bedtime was optional and wanted to help anyway. So…let’s put them to work. That was a great idea because while the sauce was good the night I made it, it was rockin’ the next morning. Everything had time to come together in the refrigerator. Since I was still up, I also cooked the chorizo and drained it for use the next day. Next, I made the dough (tossing in a dash or two of the chipotle sauce). I guess I couldn’t help from layering the flavors. The sweet, smoky heat was calling me. Once you’ve preheated your grill, be sure you have everything ready and available to use. The dough cooking process can be quick. If you get your dough caught up in the wrong place, wait to adjust it until the dough has cooked a minute or so and is not sticky and raw. Next, add the chipotle pizza sauce. Then add your toppings, and close the grill. With the pizza on indirect heat, the crust won’t burn and the cheese will melt. You know how I decided to spice up Father’s day, how do like to spice up special occasions (with food!)? Share your favorite celebratory spicy foods in the comments below. 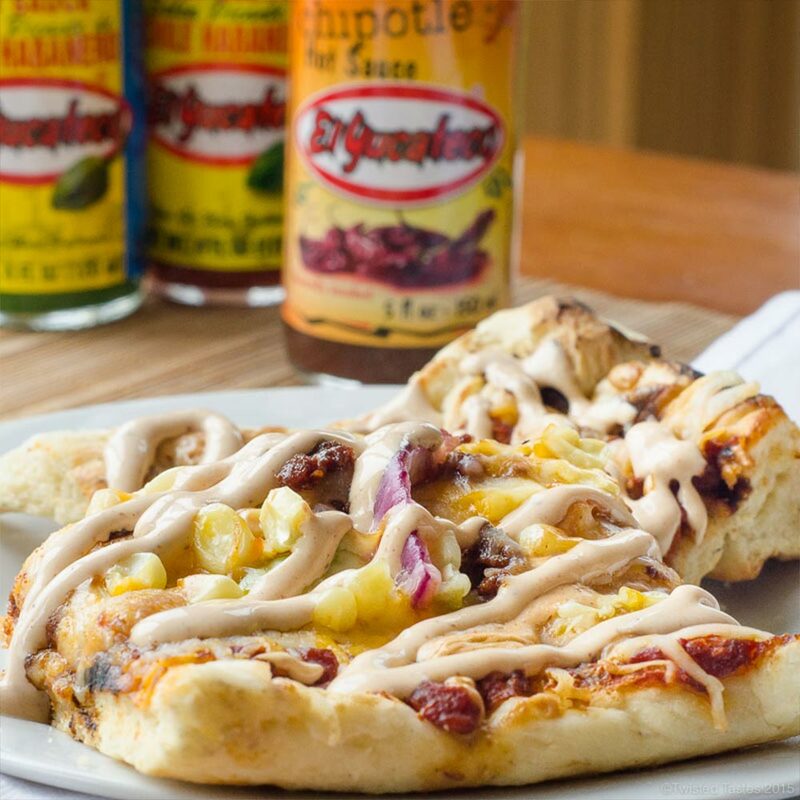 Crispy yet chewy crust covered with smokey chipotle pizza sauce, cheese, and chorizo then drizzled with creamy chipotle dressing. Proof your yeast by combining the warm water, sugar, and yeast in medium bowl. Stir until mixed and let it be until it foams (5 minutes). Once foaming on top, combine your yeast mixture with the bread flour, minced garlic, olive oil, oregano, and a dash or two of the chipotle hot sauce. Mix until a dough forms (I use my mixer with a dough hook). In a medium pot, heat olive oil on medium heat and cook the minced garlic until golden. Add in the rest of the ingredients: crushed tomatoes, El Yucateco Chipotle Hot Sauce, 1 tsp salt, onion powder, ground coriander, oregano, and black pepper. Bring to a slight boil, and turn down to simmer for 10-15 minutes (stir occasionally). Remove from heat and allow to cool. Best if used the next day (flavors meld MUCH better). Have your toppings ready and at your disposal before grilling. Cook the chorizo, have the veggies chopped, and the cheese ready. Combine the Mexican crema, El Yucateco Chipotle Hot Sauce, 1/2 tsp garlic powder, 1/4 tsp salt in a condiment bottle. Shake and refrigerate. Have toppings accessible. Preheat the grill to 500 degrees and be sure your crust is well oiled. Then, turn off the middle burner or create an area of indirect heat if using a charcoal grill (crusts burn quickly). Very carefully transfer your pizza to the grill in the area of indirect heat. I use the back side of baking sheets since they’re very flat without edges. After 2-3 minutes, using two spatulas flip the crust and begin adding the sauce and toppings on the grilled side. Note: if your crust lands in the wrong spot, be patient and adjust it in about a minute once the crust on the bottom isn’t as raw. Once all adjustments are made and the grill is down to 350-400 degrees, close the grill lid. When the cheese is melted remove the pizza and place back on the upturned baking sheet. Drizzle with the chipotle dressing cut, and serve! Repeat with second crust.